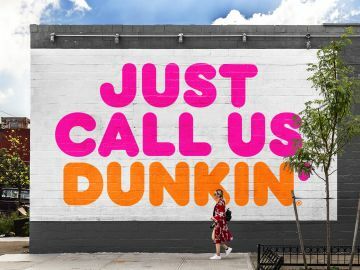 It’s been a busy few weeks here at Dunkin’ Donuts! 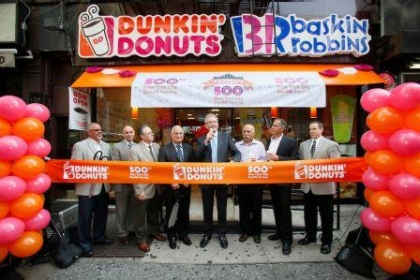 On Tuesday, July 9 we celebrated the grand opening of our 500th restaurant in the New York City area. 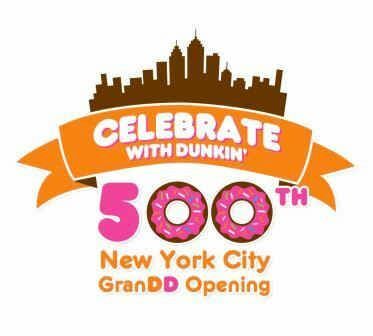 The special event included fun bakery items, games and activities, prize giveaways, as well as appearances from members of Dunkin’ Donuts senior leadership team and New York City dignitaries. 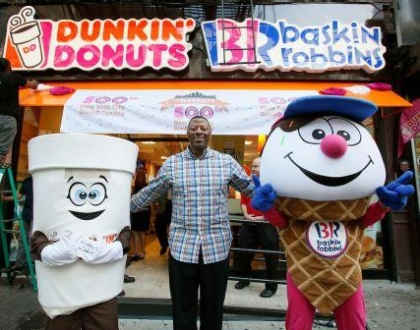 Located at 323 West 42nd Street between 8th and 9th Ave, our new restaurant is a combination restaurant with Baskin-Robbins. This location features our new restaurant design concepts and includes digital menu boards and free Wi-Fi access for guests. 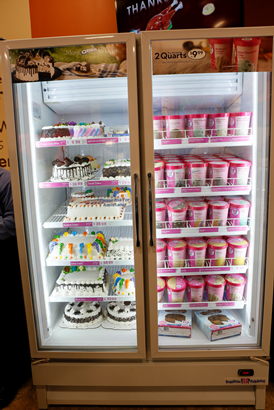 The Baskin-Robbins cake and ice cream freezer featured below offers a variety of ice cream flavors and fun designed cakes for our guests. 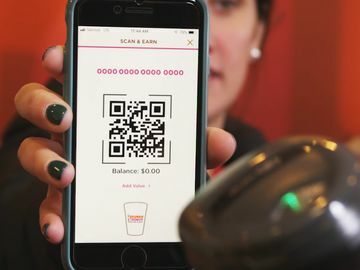 The festivities kicked off early Tuesday, with Dunkin’ Brands Chairman and CEO Nigel Travis leading the ribbon cutting ceremony alongside Dunkin’ Donuts franchisees and senior leadership. The ribbon cutting was accompanied by the FDNY bagpipe and drum band. Our guests had the chance to win special prizes by trying out our Plinko board that was set up at the restaurant. 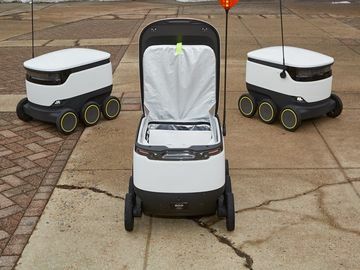 Prizes included DDestination mugs, “Friends Don’t Let Friends Drink Starbucks” t-shirts, “500” shaped donuts, free kids size soft serve ice cream cones, as well as New York Giants apparel such as footballs and tote bags. Former NFL football players Carl Banks of the New York Giants and Greg Buttle of the New York Jets were there to celebrate with us, as well as to sign merchandise and visit with fans. Cuppy and Coney were also in attendance to celebrate this monumental occasion. 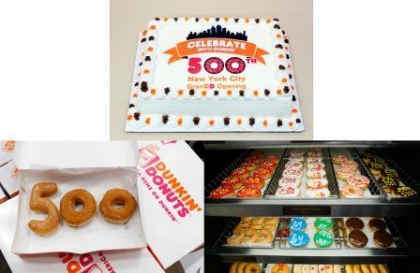 To celebrate this 500th opening, our newest restaurant offered special “500” themed donuts, a unique “500” Baskin-Robbins cake, as well as New York Giants and New York Jets themed donuts. 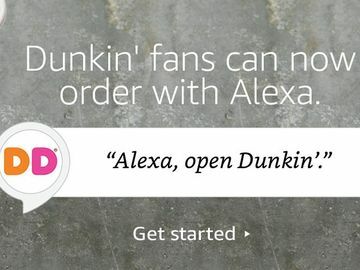 Since nothing goes better with a donut then a nice cup of Dunkin’ Donuts coffee, the restaurant also offered free hot coffee until 11 am.